I'm not much for gimmicks when it comes to books on theological matters. It's not that I take myself too seriously---God knows I don't---it's just that when authors try to get cute and warm the hearts of the reader to deep theological schtuff by making it all seem warm and fuzzy I tend to throw up in my mouth just a little. 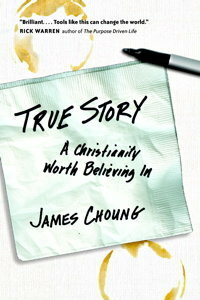 That's why when a friend recommended that I read James Choung's book on Evangelism entitled True Story: A Christianity Worth Believing In, I kind of balked. You see, I read the synopsis and when I discovered that the lion's share of the book was a fictional account of how a young man questioned his faith, re-discovered it and re-learned how to share it more effectively, I began to taste bile. But a strange thing happened as I began to read True Story: I liked it. And then I moved from merely liking it to really liking it. Choung, a divisional director of Intervarsity Christian Fellowship, asserts that the "gospel" us Christian-types have been presenting to the world all these many years is way too small for Jesus. Christianity isn't just about getting one's ticket punched for heaven. In fact, the claims that Christianity has made over the centuries are not ringing true to a whole new generation of people. We have spent far too much time evangelizing---trying to win people over---to a Christianity that is narrow, small, prideful and incomplete. Choung's use of fictional characters to tell his "true story" ends up being an engaging and thought provoking way to deliver his message that there is a Christianity worth believing, a gospel that is more expansive than we could ever imagine. Choung also uses a variation on the old "Four Spiritual Laws" method of evangelism where just about any run of the mill Christian could draw simple diagrams of what salvation was all about. Choung's diagrams make more sense and are just as easily taught to any run of the mill Christian. The difference is that the Four Spiritual Laws were all about the exclusive nature of what it meant to be Christian and Choung is presenting something that is far larger and more inclusive. True Story is the kind of book that pastors and church leaders should read with their congregations. Choung even thoughtfully includes a section at the end of the book for pastors and leaders to use as they help teach their flock how to share their faith in a much more engaging and inspiring way.